To ensure you get this bond back at the end of your lease, here are some ways to protect your apartment (and furniture) from wear and tear. Living in a rental with a furry friend? Chances are you had to pay a pet bond before moving in. To ensure you get this bond back at the end of your lease, here are some ways to protect your apartment (and furniture) from wear and tear. Dogs and cats have sharp claws, so if your home has beautiful wooden flooring you should cover high traffic areas with rugs. Choose a large carpet you can place under your couch and coffee table in the living room, and a long runner rug you can place in the hallway. Your new pal is going to teach you to be diligent about putting items away. Make sure you have easy access storage, like these baskets you can place in a bookshelf or under the TV cabinet. Some people even consider investing in a closed shoe rack to stop Fido from developing a penchant for sneakers. 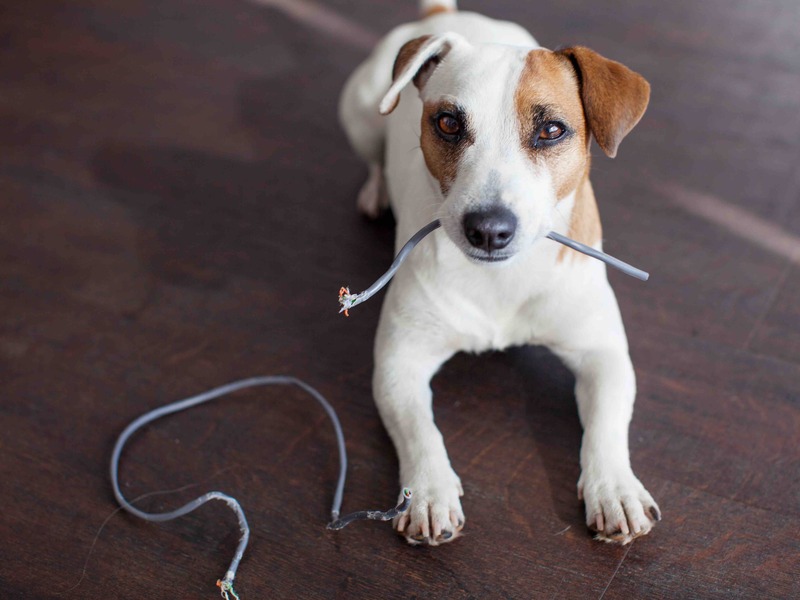 Puppies like to chew and kittens like to scratch, so protect precious furniture (such as leather armchairs and suede-covered couches) with this tried-and-tested natural method. Both animals hate the smell of citrus, so combine one part lemon juice with four parts water in a spray bottle and spritz lightly over the legs of your furniture and any other areas you want to protect. Puppies and kittens are very inquisitive — they’ll stick their noses wherever they can and are indiscriminate about what they’ll chew. This is why it’s so important to cover electrical cords so you don’t have to replace wiring when the time comes to move out. If there are areas in your home — like carpeted bedrooms — which are strictly a no-pets zone, then you’ll want to invest in a good baby gate. Target and Bunnings both have a great range, and while they won’t stop cats from potentially jumping over, they will deter them. To keep your apartment safe from any potential destructive behaviour, one of the best things you can do is make sure your pet is healthy and happy. Spend plenty of time playing with your pet, ensure it has lots of stimulating toys and if you have a dog, take it for plenty of walks. Read on to find out how you to style your art in a rental.